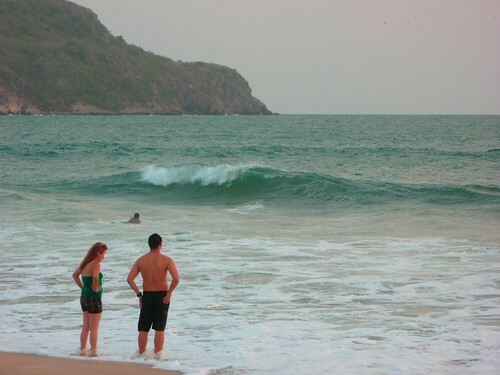 Mazatlán, Mexico was where Rachel and I decided to spend our most recent vacation. 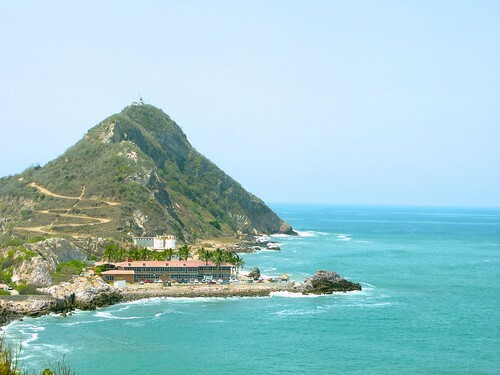 Situated in the state of Sinaloa on Mexico’s Pacific coast, Mazatlán has long been one of the country’s jewels, with a strong tourism and fishing industry as well as a unique cultural history, dating back to the Spanish conquest of Mexico as well as being the origin of “Banda” music which was created by the town’s German settlers. Mazatlán, however, like the rest of Mexico, has fallen on tough times. The local economy has been whacked just like the rest of the world, and due to recent security concerns regarding Mexico in general and Sinaloa’s role as a conduit for arms trade and violent gangs heading up the coastal region, all of the major cruise lines have ceased making stops at the port city, resulting in a loss of over 25,000 tourists per day. In September of 2011, the cruise ships are expected to return once new contracts with the city have been signed, but nothing is a given. The reality is, however, is that Mazatlán is still a very safe city, with a great deal of police protection. 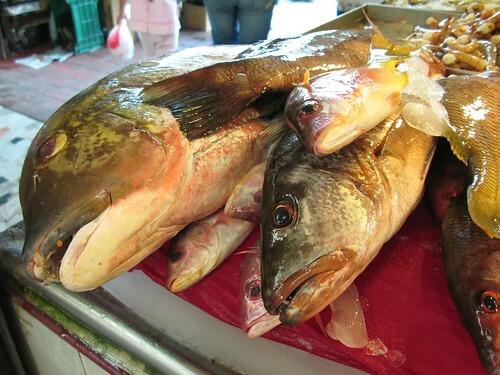 It is also an excellent value, particularly as it relates to food, as it has some of the best seafood in the world, due to its local shrimp and tuna fleets. 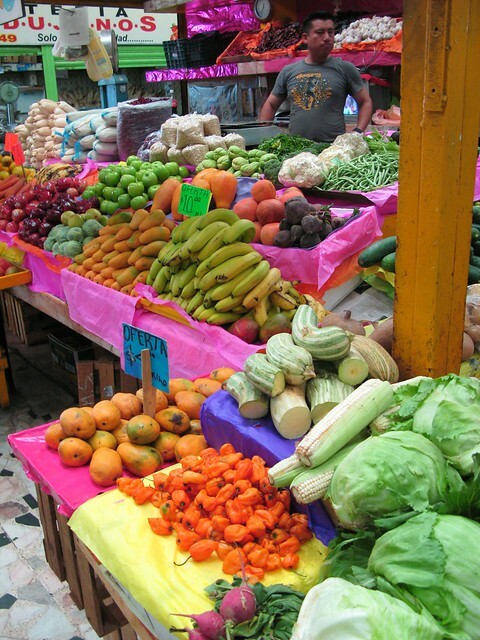 The state of Sinaloa also is known for raising livestock and has a large amount of local agriculture, so you can get some of the best steak and chicken/pork dishes here and fantastic produce as well. 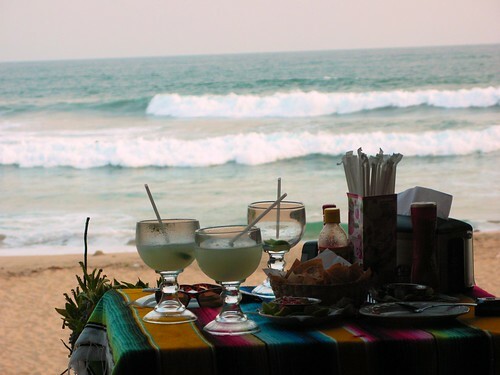 An outdoor table at La Playa Bruja restaurant in Mazatlán, Mexico. So without further ado — let’s go eat Mazatlán. Click on the “Read the rest of this entry” link below for more. 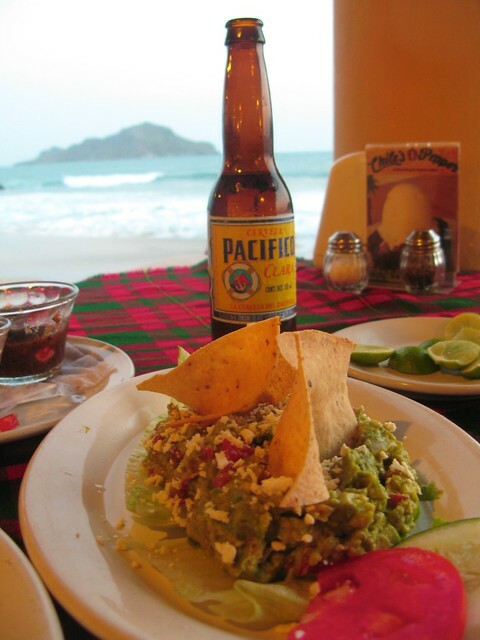 As Mazatlán is a tourism-oriented city, obviously a great deal of the food you are going to find in the local restaurants is tailored to the tourist population, many of whom come from Seattle and Vancouver. 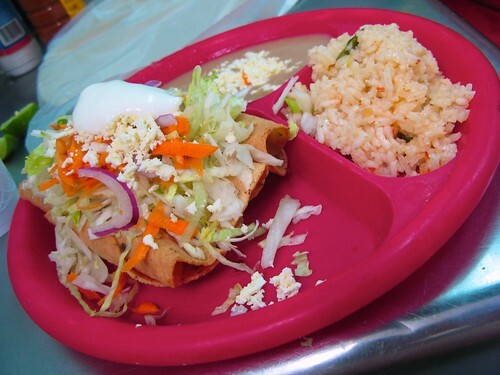 This is not to say that the food itself is bad, as a matter of fact it tends to be very good, but it is not necessarily authentically Mexican. Many of the restaurant menus at a lot of these places look very similar, making use of local ingredients but tailored to less adventurous palates. That being said, it is quite possible to have really good meals at these tourist-oriented places, provided you know what your are doing. First, let’s start with ceviche. You’re not going to find a single restaurant in this city that doesn’t serve some form of ceviche dish, because the shrimp here is fresh and plentiful. The lime/cilantro/chile preparation referred to as an “Aguachile” is by far my favorite way of eating ceviche. 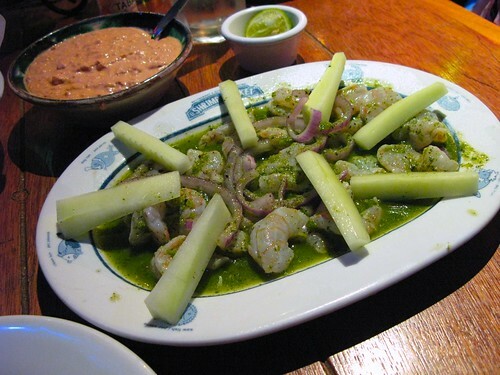 Here’s a Ceviche de Camaron de Aguachile from El Shrimp Bucket, one of the oldest tourist restaurants in the city, which opened in 1963. 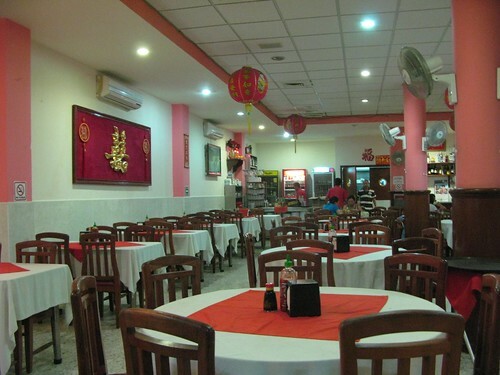 It was actually the first restaurant opened by the Grupo Anderson’s restaurant management company, which now employs over 9000 people and also owns the Senor Frog’s chain, of which you will see probably 20 different locations of various souvenir stores and shops all over the city. El Shrimp Bucket is actually a great place, provided you stick with its namesake stuff — shrimp and other types of seafood. Locals still eat there. 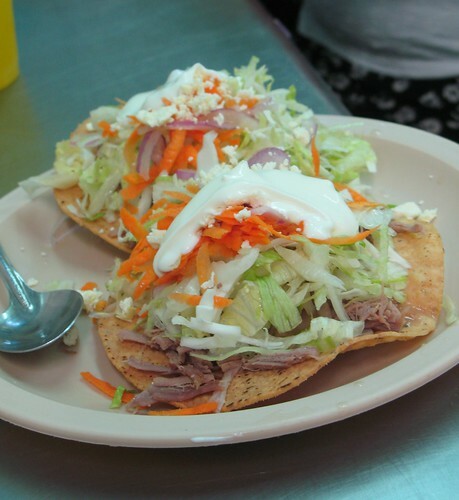 If you go off the reservation on these tourist restaurants, and go for non-Mexican dishes, you’re going to be disappointed. Stick with what the city is good at — Seafood, and traditional Mexican fare. 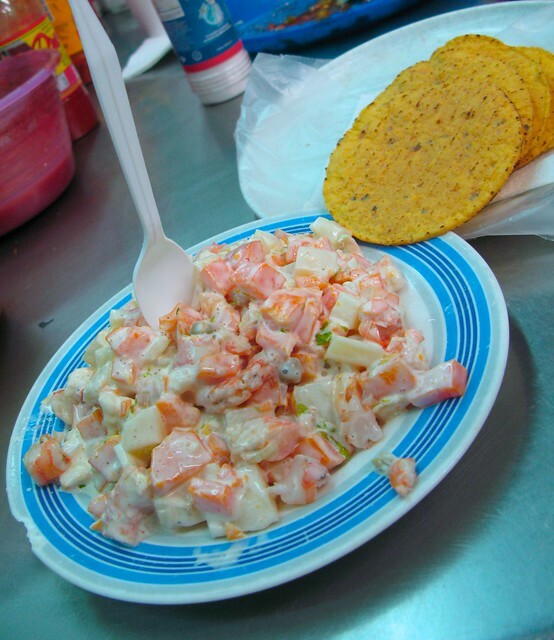 The orange dip behind the ceviche is a Smoked Marlin Dip. Rachel really loved it, but I found it too be very fishy and very strong in flavor. Here is another Aguachile preparation, at Mr. Lionso’s La Playa Bruja restaurant, which is a beachfront restaurant on the far northern part of the city past the time share resorts and the big hotels. It is an absolutely gorgeous location and a must-go, in my opinion. 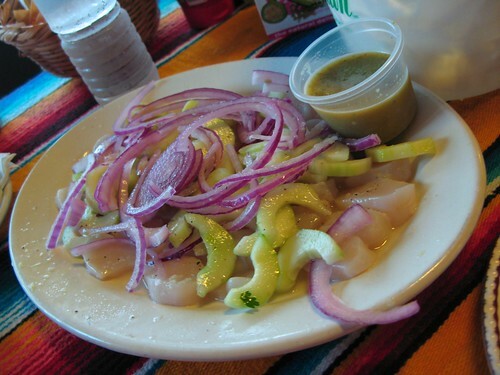 This particular Aguachile is made with pristine raw scallops, so it’s more like a sashimi dish. The Aguachile sauce is on the side. I must warn you, however, that if you order this dish, do NOT under any circumstances dump that Aguachile sauce all over the scallops unless you want your face to be on fire for the rest of the evening. It is made with a combination of lime juice (Mexican limes are very small and very tart), Serrano pepper and Chiletepin, which is explosively and violently hot, on the extremely high end of the Scoville heat scale for chiles. They don’t call it “the mother of all chiles” for nothing. Use the sauce sparingly, OK? The next dish which you will see multiple variations of throughout the city is what I refer to as “Giant Aztec ceramic sacrificial shrimp vessel lit on fire”. The one you are looking at is from El Shrimp Bucket, which I think originated the concept. 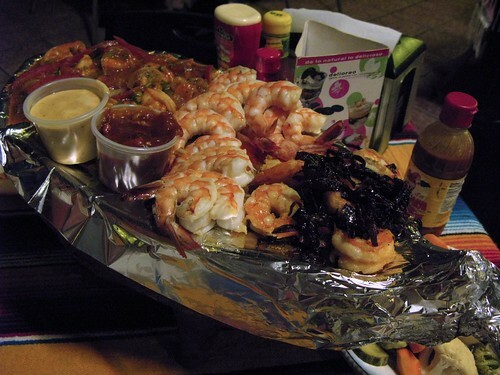 The shrimp here are big and juicy and plentiful, and come in several different preparations. El Shrimp Bucket’s are Coconut, Beer Battered, Peel and Eat, and one other which I’m forgetting. Here’s the one from La Playa Bruja. La Playa Bruja has about twelve different shrimp preparations, and you can tell them to make you a platter of any of the flavors you want. By far our favorite was al ajillo (garlic) which is prepared with sliced up dried pasilla chile peppers, sauteed with garlic in olive oil. Fantastic. 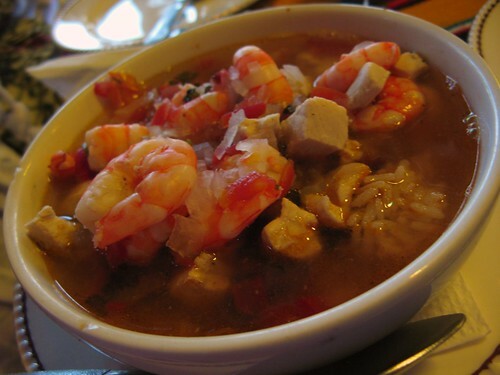 A bowl of Shrimp “Caldo”, again from La Playa Bruja. 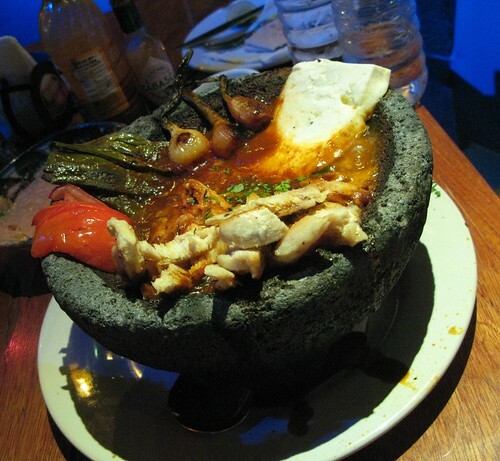 Another common dish you’ll see at the local restaurants is the Molcajete, which is the term for the actual volcanic rock bowl that is traditionally used as a mortar to grind spices and other things. 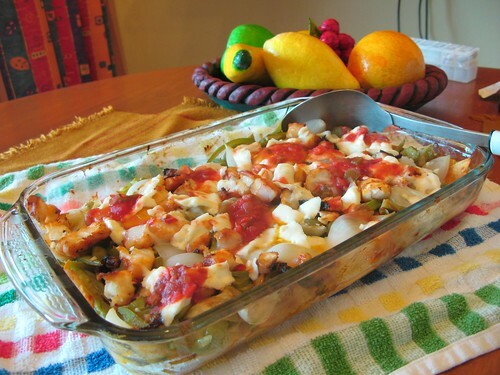 In this case, it’s used as sort of a sizzling vessel with pieces of seafood/chicken, chiles, cheese, vegetables and spices, which you cut up and put into tortillas. Sort of an alternative form of Fajitas. Gimmicky but good. 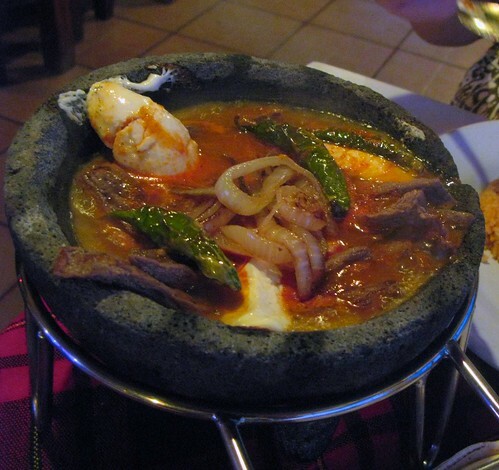 Another Molcajete appetizer, this time from Chile’s Pepper, another beach view restaurant. Bistec Tampiquena, from Chile’s Pepper. The view from Chile’s Pepper. Fresh guacamole, with a Pacifico beer, at Chile’s Pepper. “Tortilla Chips” in Mexico are referred to as “Totopos” and what we call “Salsa” they say “Pico De Gallo”. Pacifico beer is owned by the big Mexican Modelo brewery company that also produces the better-known Corona Extra, but it’s made locally in Mazatlan, and if you get it at the local grocery stores and bodegas it’s practically cheaper than Coca-Cola. 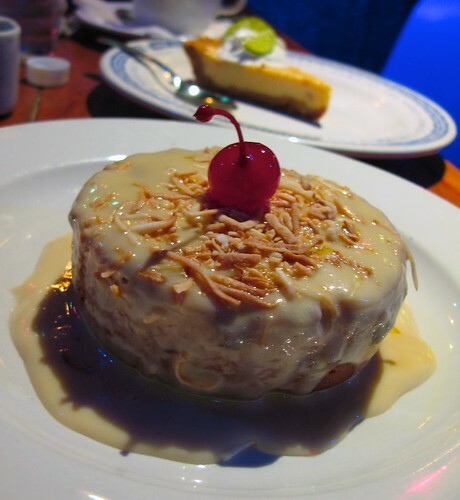 A “Pie de Coco” or coconut cake. We ordered this one at El Shrimp Bucket. If you go there, get it. Man cannot live on tourist restaurants alone. 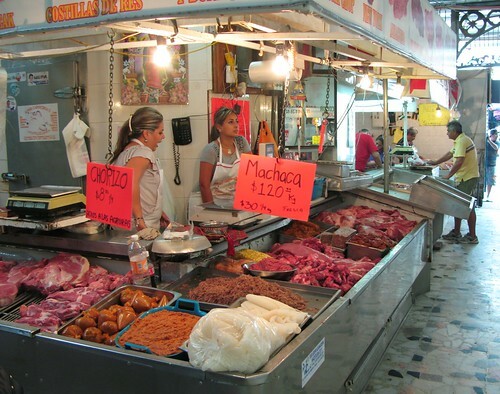 If you really want to eat like the locals, you gotta head to the central market, or Mercado Central, which is in Old Mazatlan. The Sabalo Central bus line, which goes up and down the coast, into the Golden Zone and down El Malecon (Beachfront) from where all the major hotels and timeshares are costs 90 cents, is air conditioned, and will drop you right in front of the market. Everything you can imagine is for sale here, with many kinds of stalls for meat, chicken, seafood, fruit and spices specialists, as well as food stands. And as to be expected, all of this is extremely fresh and has been caught or butchered the day it is being sold. 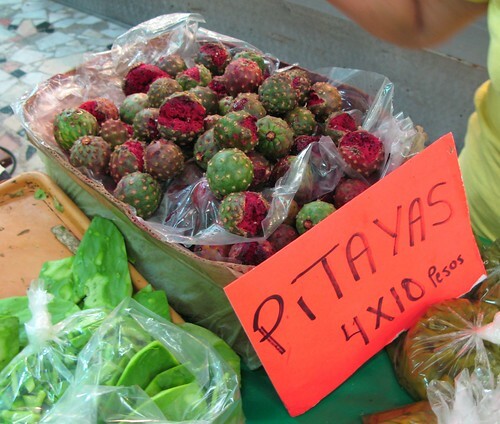 Pitayas, a type of sweet cactus fruit, sold alongside Nopal, the vegetable from cactus pads which tastes kind of lemony and has the texture of green beans with some slight okra-like slimyness when cooked. 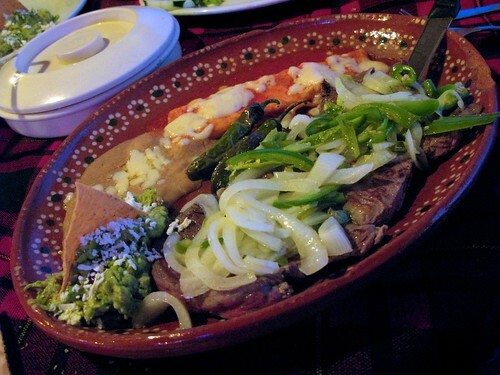 Machaca, a dried meat mixture that is often served with tortillas. One of the many fruit and veg vendors. 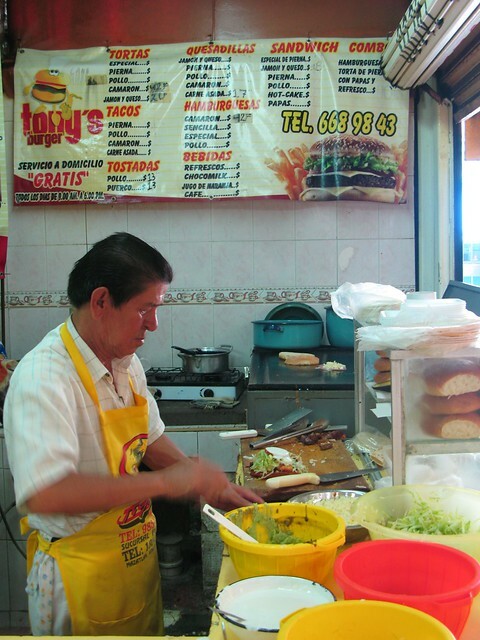 Tony’s Burger, one of the several fast food stands in the Market. A chicken tostada, from Tony’s. 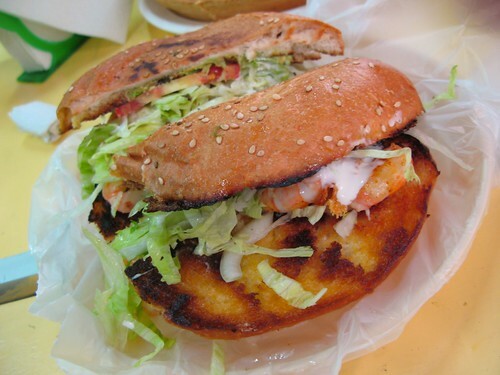 “Hamburguesa de Camaron” or shrimp burger. It’s got crema fresca, avocado, lettuce, tomato and freshly grilled shrimps, on really nice toasted hamburger rolls. 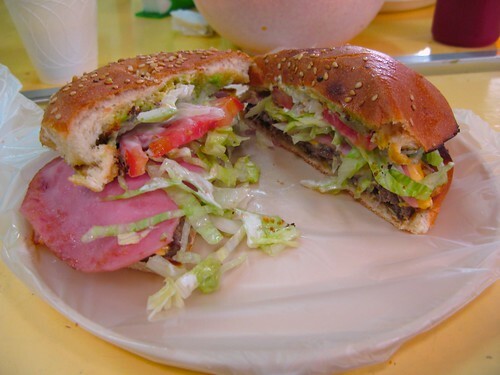 And here’s Tony’s “Hamburguesa Especial” with cheese, avocado, ham, crema fresca and hamburger patty. 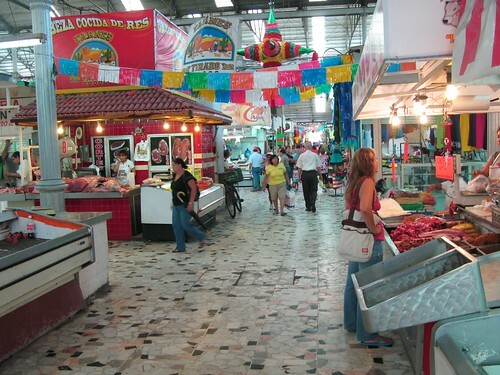 My favorite place in the market, however, is simply “The Carne Asada ladies”. 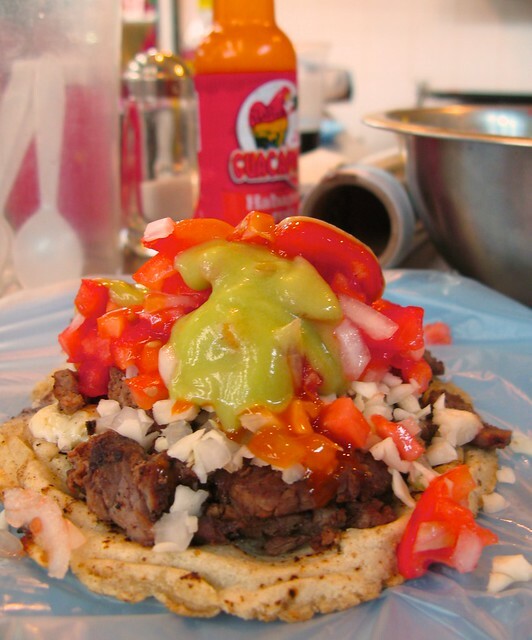 This stand specializes in Tacos Chorreadas, a style unique to the Sinaloa region which are freshly made corn tortillas, similar to Sopes, that are griddle cooked with a giant pile of marinated chopped steak on top. To best illustrate this, see the video below. Taco Chorreada de Carne Asada. The best taco I have had in my entire life. It has fresh pico de gallo on it, along with a roasted tomato and chile salsa, a fresh hot sauce, a creamy avocado sauce, melted cheese, chopped raw onion, some secret ingredient I cannot identify, and habanero hot sauce. The Agua Fresca stand outside the market. 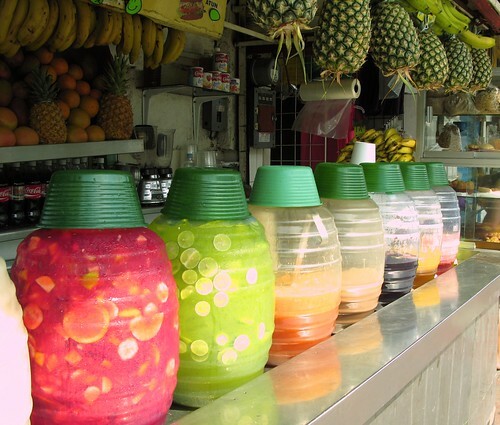 These are “Fresh Waters” or fruit punches of different flavors, a popular drink throughout Mexico. A Tuna vendor in the market. Mazatlan has a pretty big tuna fleet, and sashimi grade tuna can be procured here. There are a lot of sushi restaurants in town which serve the locally caught fish. 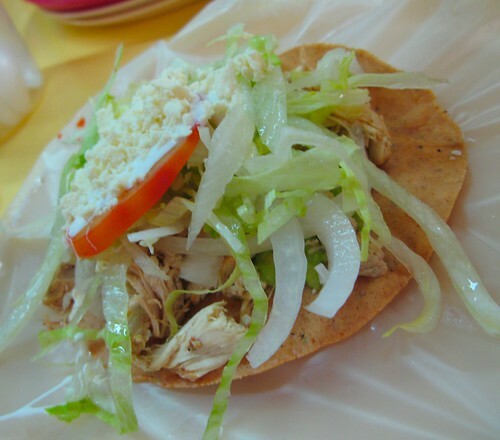 Pork tostadas, which we consumed also at a stand in the market. 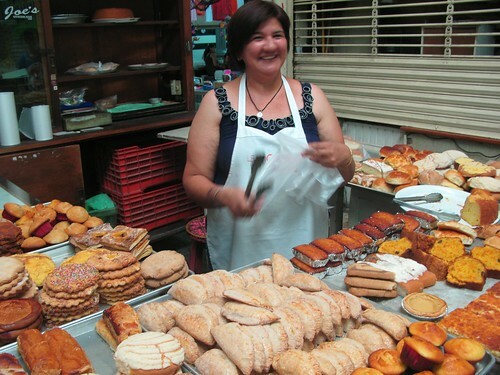 The bakery stand at the market. Very dangerous place for me to be. I’m not exactly sure what this store in the market was for, but it had a lot of weird candles and stuff. 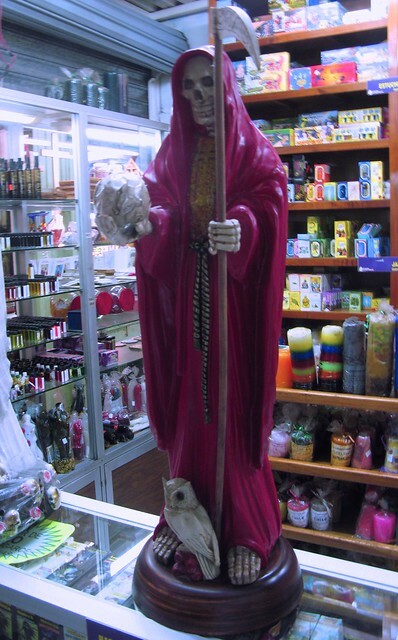 “The large statue front and center in the photo is called “La Santa Muerte” and is a cult ‘saint’–not a saint that’s recognized by the Church–that’s mostly venerated by folks involved in gangs. The seat of La Santa Muerte is in the Tepito neighborhood of Mexico City, one of the most unsavory neighborhoods in the country. Google it for more information. 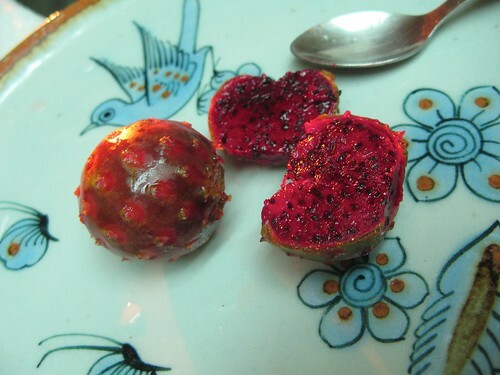 These tiny fruits are Manguitos, literally bite-size mangoes that you shove in your mouth, chew, and spit out the pits and skin. By the way, the price shown is in pesos, which is the same symbol as the dollar and is currently exchanged at about 10 pesos to the dollar. So 15 pesos is $1.50. Per half Kilogram, roughly a pound. 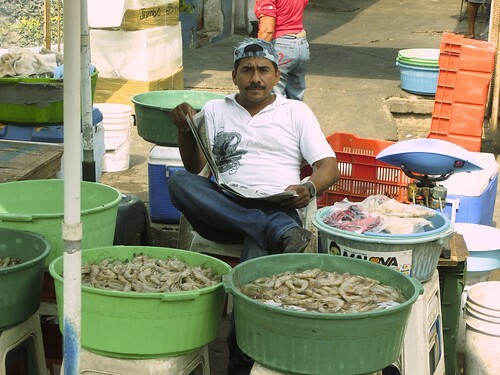 Near the main market but several blocks away are the Cameroneras, the shrimp mongers. Here you can buy the same shrimp that the local restaurants buy, for a fraction of the price you’d pay in the States. 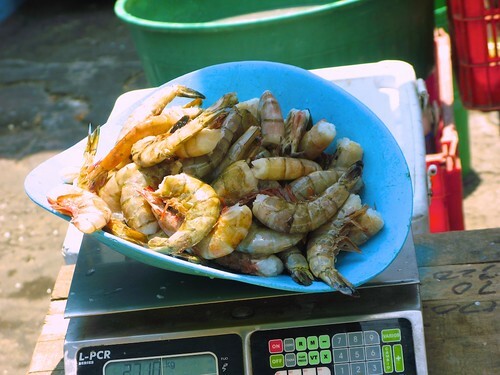 Over two and a half kilograms of the very largest shrimp the Cameroneras offer. I paid $10 a pound for what I easily would pay double for in New York or New Jersey. 500 pesos, or $50 for this massive amount of ultra-jumbo sized shrimp. We made several meals out of this. This is a Chilaquiles de Camaron, with Nopales, Cebollitas (little onions) and melted pinella cheese with eggs and totopos and red salsa. Like a big nachos. Rachel made this in our timeshare with stuff we bought from the market. So after a week of eating Mexican food, we got a craving for… Chinese food. La Muralla China is in the Golden Zone right next door to the Burger King, on Camaron Sabalo, the main drag along the Sabalo Central bus line. You can’t miss it. 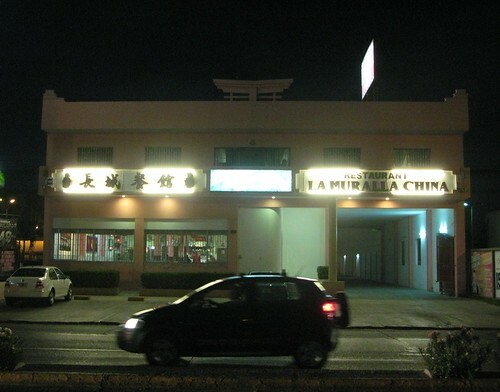 Muralla China has three locations but this is the one that delivers, in case you don’t want to leave your hotel. 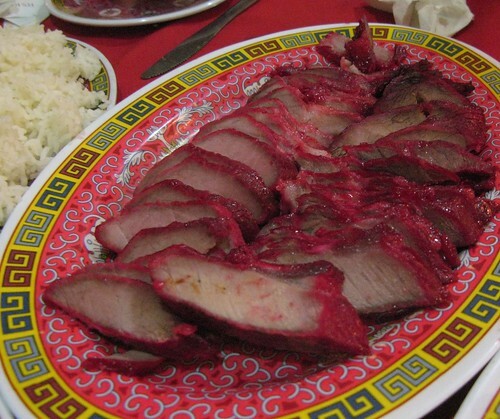 Stepping into this restaurant is like being thrown into a 1960’s Chinese-American Time Warp. In a good way. 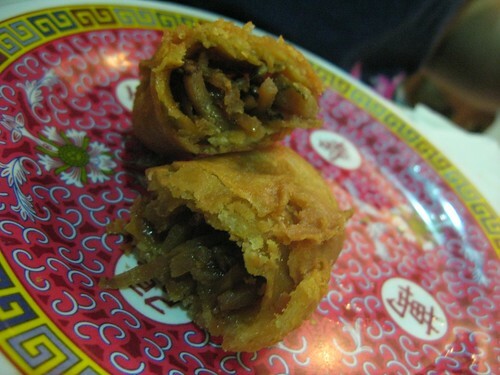 An Eggroll. Totally not what we expected, had a very strong five spice flavor and like a beer-battered exterior, and served with a sweet and sour neon red sauce. It was weird. We liked it. 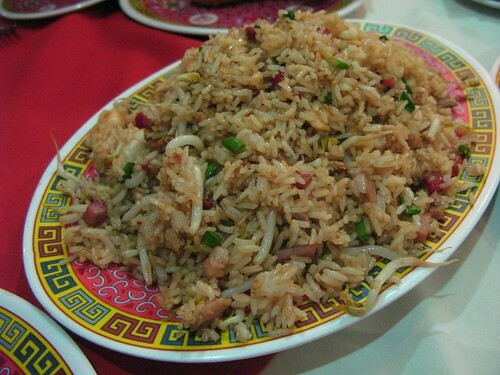 Special Fried Rice. All the vegetables were fresh and the meat and seafood in this was local. In fact, every single dish we ate was prepared with local ingredients, and they didn’t use MSG so nothing was very salty — we actually had to add a bit of soy sauce to it. Sinaloa does not import any meat or livestock and the restaurant doesn’t use any foreign produce, so they have to be completely self-reliant. Extremely good. 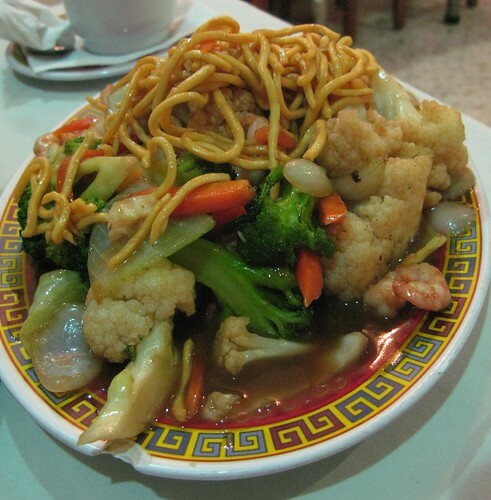 Shrimp Chowmein. Again, all vegetables and the shrimp are local. So it was very good, even though it is not “authentic” in a purely Chinese sense since there are no Asian vegetables in it. It’s authentic Mexican Chinese Food! I do not recall exactly what this dish was called but it was shown in a picture on the menu. 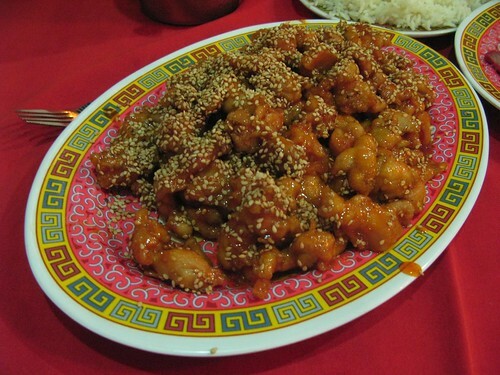 It’s like a cross between a sesame chicken and a General Tso, but spiked heavily with Sriracha sauce. Highly Recommended. Made with locally killed chicken. 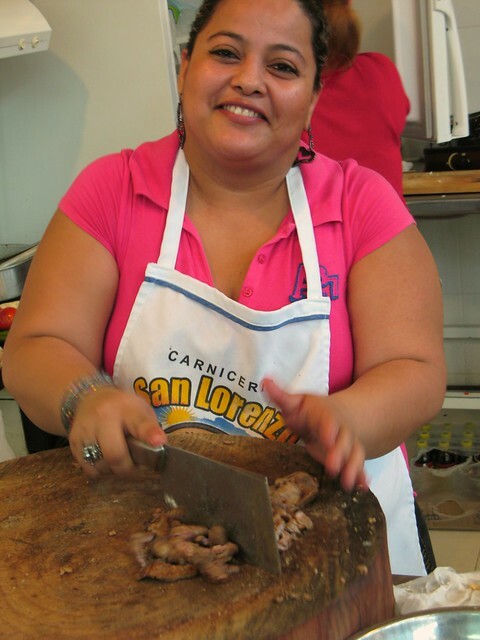 Roast Pork (Puerco Ahumado) made with local pork. Excellent. What more could you want from a vacation? Guys jumping of cliffs? This entry was posted on Tuesday, June 7th, 2011 at 5:57 pm and is filed under Food. You can follow any responses to this entry through the RSS 2.0 feed. You can leave a response, or trackback from your own site. Sounds like you had a fun visit, you caught some of the highlights, for sure. Although there are some things I would have recommended… like pescado zarandeado at a palapa restaurant at Playa Norte, Puerto Azul, Zab Thai in the golden zone if you felt like something other than mexican, an evening in the Plazuela Machado listening to music and eating or drinking or dancing… oh, forget it there is too much I love about this place to list it all. My husband and I have lived here in Maz since 2007 and I have been blogging about our lives here. I am so glad you had a good time! Saludos, amigo. Don’t worry Nancy, we’re definitely coming back, and soon. It’s kind of hard to get EVERYTHING out of the city in a week. Mazatlan is remarkably big, even when compared to larger cities in Mexico. Holler when you come back and I’ll send you an email with my must-do’s if you like! 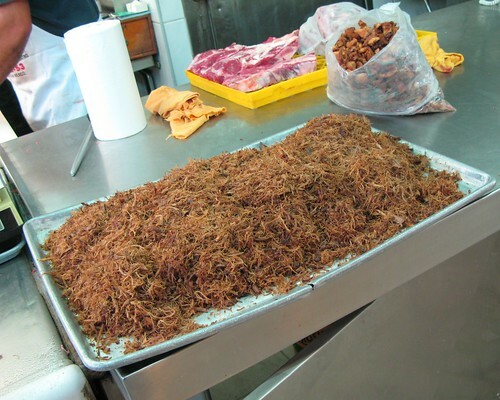 I would kill a hobo for that giant mound of machaca. Nothing could be further from the truth. 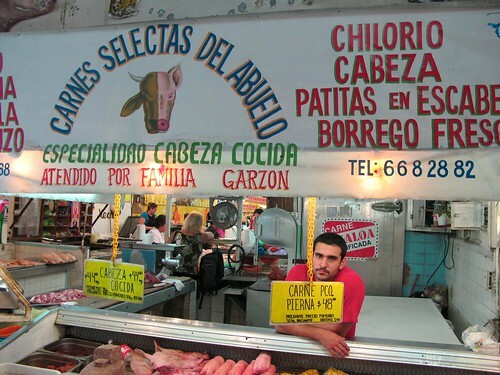 Many meat markets sell beef imported to Mexico from the USA. Vegetable and fruit markets sell everything from apples and asparagus to…well, you name it!…from Washington State-grown apples and Bing cherries, USA-grown Bosc pears, Chilean plums and nectarines, etc. 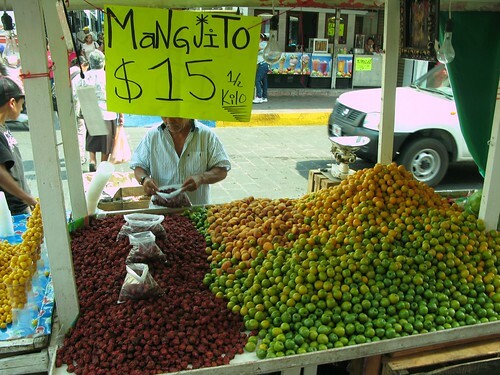 I’ve lived in Mexico for more than 30 years and see all of this stuff at the tianguis (street markets), complete with its labels, at least twice a week. I wish all of your photos were visible. About one third are missing. Oops, this is a PS. I just reloaded the page and all the photos showed up. That stand with the “Día de los Muertos stuff” isn’t that at all. The large statue front and center in the photo is called “La Santa Muerte” and is a cult ‘saint’–not a saint that’s recognized by the Church–that’s mostly venerated by folks involved in gangs. The seat of La Santa Muerte is in the Tepito neighborhood of Mexico City, one of the most unsavory neighborhoods in the country. Google it for more information. 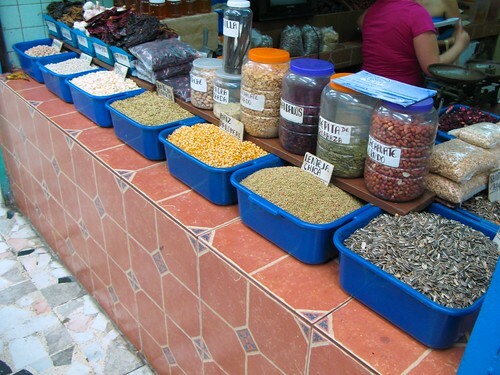 Most of the other items in the shop appear to be things used in Santería rituals, magical treatments for people who suffer from disorders like bewitchment, etc. The shop absolutely does NOT sell Día de los Muertos items. Interesting, thanks. I’ll edit the copy to reflect. Cristina, I’m only going by what the restaurant management at that Chinese place told me, and I do speak Spanish semi-fluently, so it’s not lost in translation. I’m going to guess that certain types of agricultural and meat products are imported in other parts of Mexico, but not so much in Sinaloa. 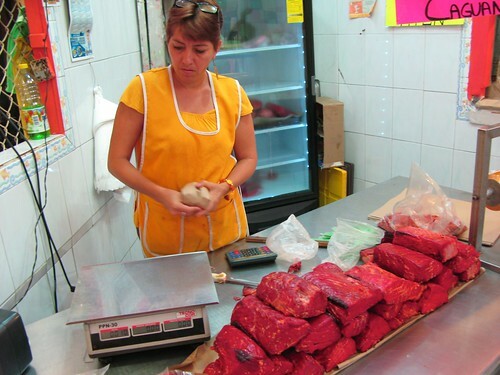 Sinaloa raises a ton of its own Beef and chickens and other things besides their huge fishing industry. In the DF and other states where they don’t, my guess is they have to import more. They told me at that restaurant every single produce item and protein came from locally grown vegetables, locally raised livestock or locally fished seafood. I’m assuming stuff like chinese condiments and such had to come from elsewhere or they couldn’t make the cuisine. I noticed that the soy sauce was imported from Taiwan, for example. I actually didn’t look that closely at labeling on produce in the Mercado. So I don’t know what there might not been of Mexican origin. I can’t seem to find the post where you mentioned going to some islands in the Carribean where there was a lot of french food. We’re planning a vacation right now and I’d like to read your post on it. Thanks. 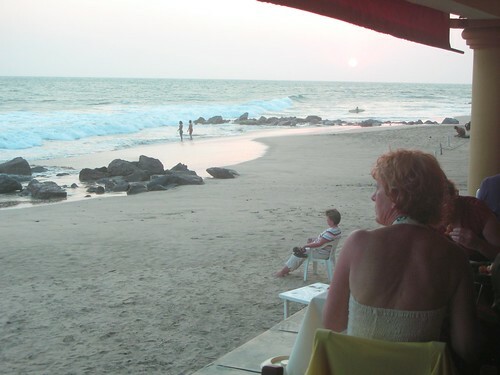 We Have eaten at La Bruja (The witch) north of Mazatlan a few times in the past (2008-2009). We LOVED the shrimp dishes there, especially the coconut shrimp, served with a mango sauce for dipping. We are going back Feb, 2012 and look forward to going there again. Also really like a small place called El Bambu. They served a chicken breast in “spanish sauce” that was the best chicken I have ever eaten. Neither place was high priced. 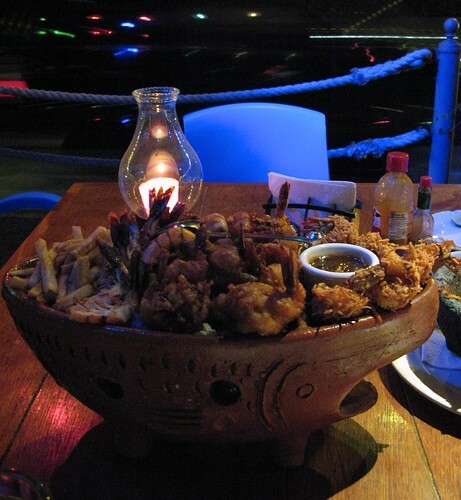 I think the coconut shrimp was about 130 pesos($11 US). The spanish chicken was far less, Maybe $7 US. If you want the best mango margarita, go to Pueblo Bonito & get served by the pool or ocean.Rich mango flavor & blended ICE cold.